The outdoor preschool program at Meadowbrook Playfield, known as Tiny Trees begins September 10, 2018. Having a ‘AM’ and a ‘PM’ schedule that hosts a total of 32 children, is now full. The Seattle Preschool Program is a financial aid piece that supports those in most need. 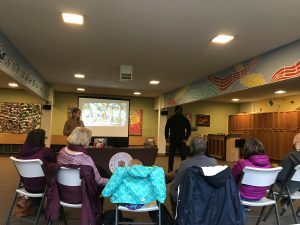 This past March, an Open House was held at Maple Leaf Lutheran Church to welcome families, inform future parents and give an overview of how the program works. Below is the descriptive text in the offering to the larger community on the Tiny Trees Preschool Website. With an incredible diversity of landscapes and natural wonder, including beaver dams, a wildlife sanctuary, fruit orchards, and a community garden, Meadowbrook Park is an ideal location for exploration and hands-on learning. Your adventurer will ramble through the forest and orchards, get muddy and giggly in the marshy streams, and search for treasure on the banks of Thornton Creek. At this nature preschool, the majestic landscape is the third teacher – presenting ample opportunities to learn math and science concepts through the natural world.